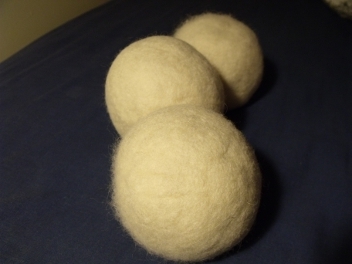 Wondering how to make wool dryer balls? If you've never heard of them, here's some information for you to consider. Wool dryer balls are made of natural materials, and will reduce static and speed up drying times by 25% or more to save you time and money. 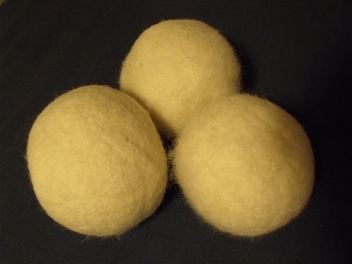 Wool dryer balls will gently soften your cloth diapers, but why stop there? If you’re looking for ways to eliminate harmful chemicals routinely used in your laundry, look no further! 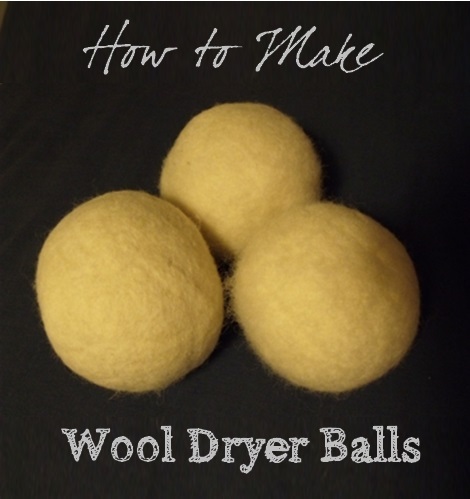 You can make wool dryer balls to be used with all of your laundry. Even if you’re not remotely crafty, you can make yourself a set of wool dryer balls in the amount of time it takes you to watch your favorite show on TV. Our article on wool dryer balls provides more information on the benefits of this eco-friendly and cost-effective replacement for fabric softeners and dryer sheets. 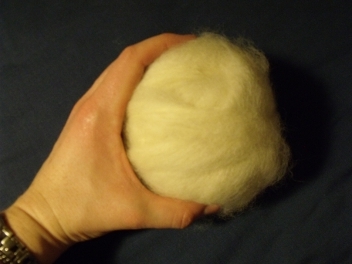 When I first decided to make wool dryer balls, I looked for wool yarn. I had a heck of a time finding it, so I decided to make dryer balls from wool batting. For this project, I used wool batting I had purchased from West Earl Woolen Mills for another project. West Earl Woolen mills are located in Pennsylvania. 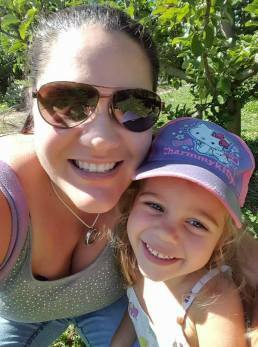 This small cooperative doesn’t have a website, but they do ship internationally. If you’re interested in buying wool from them, you will need to call them at 717-859-2241. Or, try typing “wool batting from woolen mill” into your search engine – this will produce a surprisingly long list of other companies who sell wool batting! 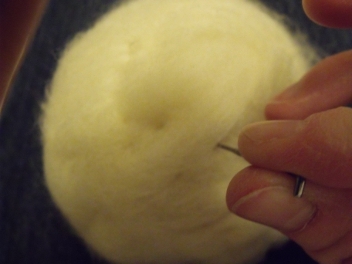 I did purchase wool felting needles from a shop on E-Bay, but they are really not necessary to make wool dryer balls if you can wind the wool tightly. You will need them if you plan to "decorate" your dryer balls with designs from colored felting wool. Turn the nylon stocking inside out so the toe seam is on the outside. Next, lay out the wool batting. If it isn’t clean, remove all plant particles and impurities before you start. 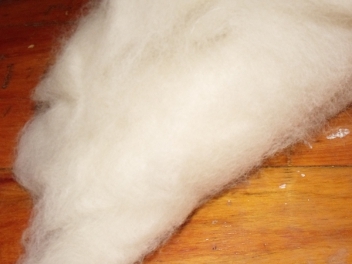 As shown below, we’ll use the wool to form a tight core for our dryer ball. Using small lengths of wool batting, wind tightly into a small ball, twisting wool as you go to smooth out strands. You can’t tell from the photo, but this ball is only a couple of inches in diameter. If you have a felting needle, you can use it to poke loose ends into the core as you go. 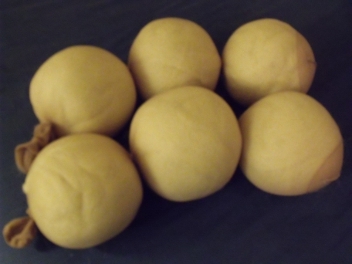 I made a half dozen dryer balls without a felting needle, and not one of them has unravelled. Once they’re felted, you’ll be fine! Continue to wind strips of wool batting around the core until you have a ball the size of a soft ball (roughly 8 to 9 inches in diameter). Keep the wool as smooth as you can, but don’t fuss too much. Again use the felting needle if you have it, otherwise smooth out the wool as best you can. Carefully shove the ball into the nylon stocking until it is tight against the toe, and then tie a snug knot in the stocking so the ball holds its shape. Repeat until you have as many dryer balls as you would like to make. There are two steps necessary to felt your wool dryer balls. You should first wash your dryer balls in your washing machine using hot water and a small amount of detergent. Next, run them through the dryer on high heat. They will shrink down, and may even appear somewhat wrinkly if you wound your balls more loosely. Don’t worry, unless the wool is peeling away from the core, they will work just fine! It’s usually best to repeat the felting cycle twice. One small tip: use a new stocking for the second cycle, or at least loosen the balls in the stocking. I discovered the hard way that the wool gets caught up in the nylon, and after 2 cycles, it is nearly impossible to peel apart! 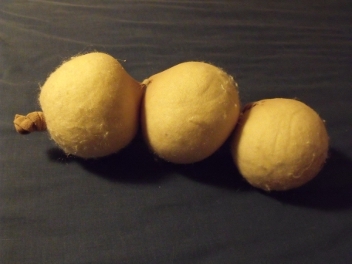 As the wool felts, the balls shrink down. If you formed your wool batting into a ball about the size of a softball, you will get a ball roughly the size of a tennis ball when you are done the felting process. Now, remove the dryer balls from the nylon, and add them to your dryer. They are ready to use to fluff up your laundry and remove static. Using 4 or more of them can reduce your drying times by more than 25%, saving you time and money. Really, the more the merrier! For large loads, such as jeans and towels, consider adding 6 or more. If you plan to add designs to your dryer balls with colored wool batting, please note that you should first felt your balls, and then add the designs and run a second felting cycle later! It seems everyone is looking to go green these days. Now that you know how to make wool dryer balls, they can make a great gift, and they are fast and easy to make. Plus, they make safe and attractive toys for pets and small children to play with inside the house! Would You Rather Buy Wool Dryer Balls? Interested but not feeling so crafty today? Amazon.com carries a number of wool dryer ball offerings, including this reasonably priced set of 6 Woolzies wool dryer balls. 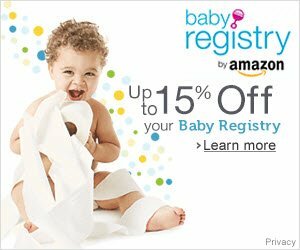 You can also buy wool dryer balls individually through Diaper Junction and use code AFL550 to save $5 off your first order of $50 or more. For more do-it-yourself cloth diapering projects and tutorials, go back to Making Cloth Diapers.